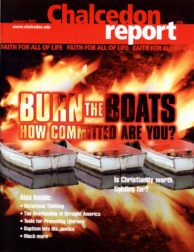 Helping Christians apply the Word of God to all | Chalcedon Foundation Burn the Boats: How Committed Are You? Burn the Boats: How Committed Are You? Once, men looked up to Christians because they wielded wisdom, understanding, and accomplishment. With their Christ-centered foundation, they spoke with meaning and relevance to a dying world. Maybe it's time we, too, burned our boats and settled down for the spiritual battle that manifests itself in the physical world, remembering, that with God on our side, eventual victory is certain. For Christians, I think it should be clear whose agenda has been moving forward in America when school officials focus on bullying being immoral but the sin of homosexuality is "an acceptable alternative lifestyle." In order to evaluate the actual performance of the Federal Reserve Bank, we must understand its context. "Leave Longview, Texas, Friday, August 2 @ 10:30 AM on Amtrak's Texas Eagle...." So began my diary entry at the start of my railroad journey to California to speak at the Third Annual Student West Coast Worldview Conference (August 5-10, 2002). "Do you think that history is objective?" A colleague recently asked me that question, referring to an old debate among historians. It is an important question for our postmodern age, and one that touches both on the nature of history and the nature of truth.